If you live in Los Angeles, make sure you keep yr schedule open on December 15 — you’re not going to want to miss Tennis System play as a part of Traffic Ctrl, a new monthly series at the Airliner. Kill/Hurt is a co-presenter for the event, and we’ll be there on hand with copies of KH010 – Teenagers by Tennis System! This will be your first chance to grab a copy of this rad tape. For more information and to RSVP, head on over here. 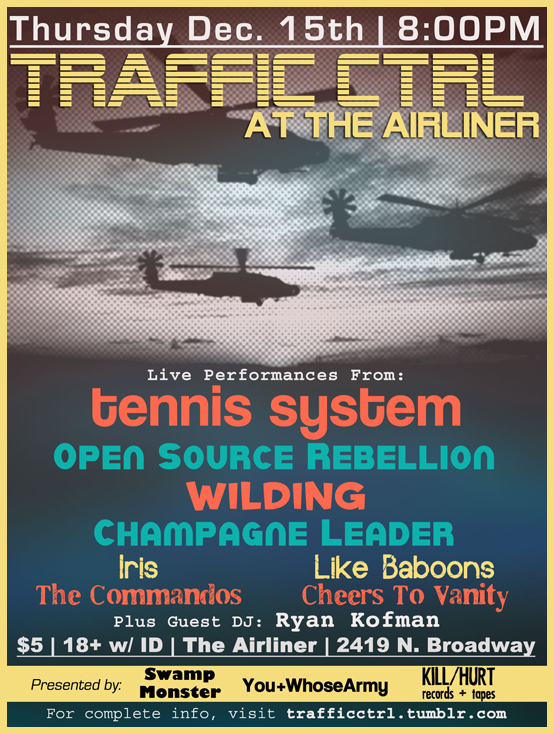 Tennis System w/ Open Source Rebellion, Wilding, Champagne Leader + More. This entry was posted in KILL/HURT, SHOWS, TENNIS SYSTEM.